Not sure where the markets are headed in 2016? We can help! Organic Valley – Organic Valley is a mission-driven cooperative, owned by family farmers, and have been leaders in organic agriculture since 1988. Their decisions are based on the health and welfare of people, animals, and the earth. With this philosophy they’ve been able to steadily increase milk pay price (while conventional prices have been a rollercoaster), offer premiums to farmers in transition, and offer various other opportunities in beef, pork, eggs, produce, and grain. East Central Division Manager for Organic Valley/CROPP Cooperative, Kevin Kiehnau, will share how demand for organic products has grown dramatically, the demographics of those markets, and the opportunities that exist for farmers, and help provide what consumers want today. Kevin raises organic beef with his family in Door County, Wisconsin and has been working with member growers for over 10 years. Clarkson Grain – Clarkson Grain is an Illinois-based grain, oilseed, and ingredient supplier to the food manufacturing and animal feed industries. They specialize in the growing, storage, and processing of identity-preserved, non-GMO and organic corn, soybeans, and soy ingredients. They procure their corn and soy raw materials from grower partners throughout the United States and Canada. Organic Transition Coordinator for Clarkson Grain, George Kalogridis, will discuss the increasing demand for their exclusive corn and soybean varieties, and ways you can help meet this demand. George has been involved in organics since the 1980’s. For the past 3 years, he was a Certification Officer for ECOCERT ICO. He was a founding member of the Florida Organic Growers, opened the first organic wholesale produce operation in Florida, and was the Vice President of Grower Operations for Earth’s Best Baby Food in Vermont. Bay State Milling – Bay State Milling is a family owned company with a strategic intent to support the growth of the next generation of grain based foods in North America by providing the leading array of plant based ingredients. Since 1899, they have proudly provided exceptional quality flour and grain products while continuing to build on their legacy as they bring new supply chains and technologies into their realm of capabilities. Bay State Milling processes both conventional and organic flours. Specialty Grain Originator, Doug Lockwood, will talk about grain supplies that Bay State Milling needs now and in the future. He has been with the company for over 15 years. Bay Shore Sales – Bay Shore Sales is family owned and offers a full range of organic and commercial inputs, including tine weeders, seed, poultry products, and organic fertilizers. They’re one of the country’s largest providers of certified organic black beans, but also offer navy beans, small reds, pinto, cranberry beans, great northern, and a variety of kidney beans. Owned and operated by Jim Sattelberg (and his family), Bay Shore Sales is located in the thumb of Michigan. Jim is well versed in the financial, marketing, and production considerations and processing needs for specialty grain and edible dry bean success. As the demand for these crops has grown, the Sattelberg family has expanded into buyer relations, processing, seed and equipment sales to better help other farmers fit these crops into their rotations. Goodness Greeness – Goodness Greeness is the Midwest’s leading source for fresh, organic produce and the largest privately held organic distributor in the country. Founded in 1991 by CEO Robert Scaman, Goodness Greeness was the first ever certified organic operation in Chicago. The company directly supplies over 300 stores that include the region’s largest supermarkets and independent retailers. They’re committed to supplying customers with the finest organic food from around the world, while at the same time furthering purchases from Midwest’s small and medium sized, local, organic farmers. Robert will talk about demand, what buyers want, and how growers can capitalize. Organic Consultant – Reggie Destree, a Wisconsin-based Organic Marketing Consultant and former organic farmer, is so passionate about organic farming that his license plate says ORGANIC! Reggie stays on the cutting edge of organic marketing opportunities and trends, and will introduce you to several you might just want to pursue. He is also an expert on organic production (soil fertility, plant health, weed & insect control, tillage, etc.) and a representative for both Dramm Fish and AgriEnergy Resources. Reggie will tell you how to “cash in” on both certified and transitional specialty and traditional organic crops. 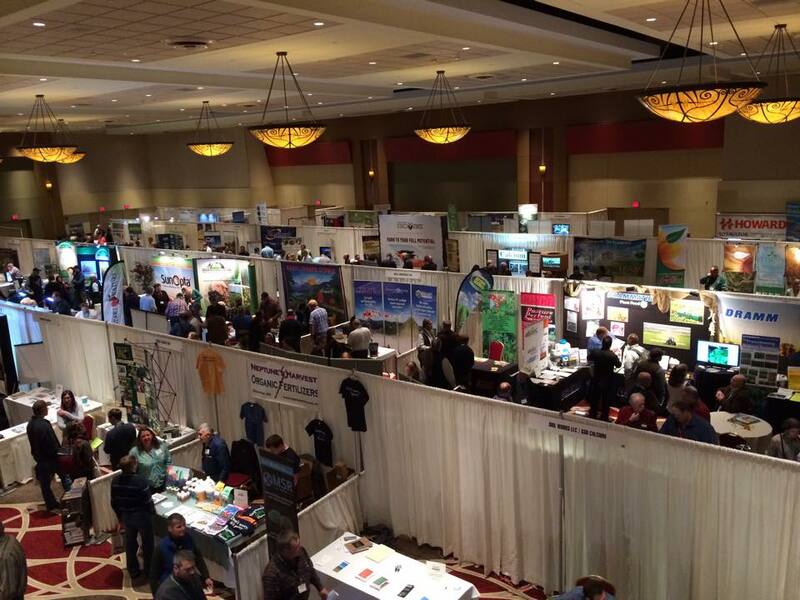 Our seminar, Next Generation Farming: Yesterday’s Wisdom + Today’s Technology = Our Future, will be held from 8:30 a.m. – 5:00 p.m. Tuesday, January 26 at the Timber Creek Convention Center, 3300 Drew Avenue, Sandwich, Illinois 60548. A block of rooms have been reserved at the Timber Creek Inn & Suites (attached to the convention center) 630-273-6000. Please note, there is no charge to attend this seminar. Reservations were due by January 18, but we have a limited number of seats still available. Please RSVP to AgriEnergy Resources 815-872-1190 or info@agrienergy.net. P.S. For daily seminar updates, like us on Facebook and follow us on Twitter. As you know, we take soil health very seriously. It’s only when you maintain healthy soil that yields can improve. Once you’ve started working with the soil, then you can begin implementing other changes. But what changes should be implemented and are they the right changes? We’ve found the Haney Test to be very helpful in this area. So much so that the mastermind behind the Haney Test, Dr. Rick Haney, has graciously accepted our invite to speak at our upcoming seminar, Next Generation Farming: Yesterday’s Wisdom + Today’s Technology = Our Future. 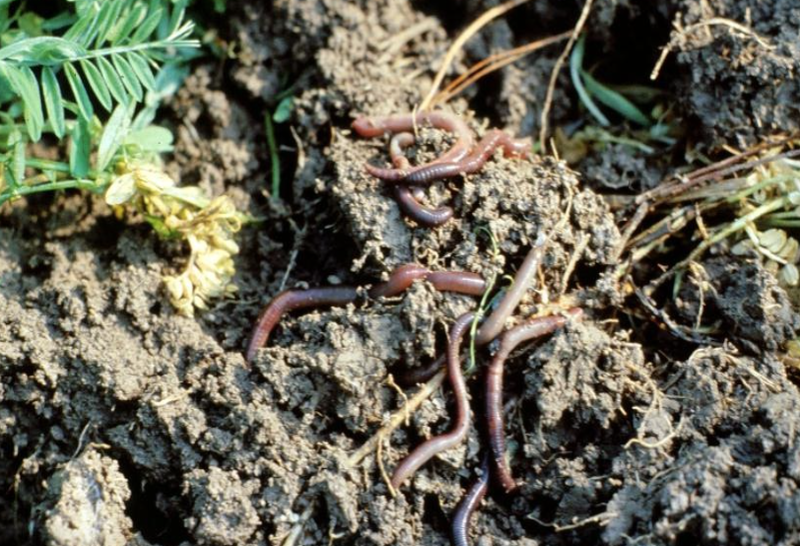 Healthy soil should have thriving biological activity, such as these earthworms. Dr. Rick Haney worked for farmers and ranchers off and on from 1975-2000 and received a Bachelor of Science degree in Biology/Chemistry from SWOSU in 1993. He then continued his education earning a Master’s Degree in Soil Microbial Ecology from Texas A&M University in 1997 and a PhD in Soil Chemistry from Texas A&M University in 2001 followed by a Post Doctorate in Herbicide Chemistry in 2002. He is currently a Soil Scientist with the Grassland Soil and Water Research Laboratory through the USDA-ARS in Texas. He will share with us a deeper knowledge of the Haney Test and how we can better achieve soil health. Through an integrated approach, the Haney Test uses chemical and biological soil test data to mimic nature’s approach to soil nutrient availability. It’s designed to work with any soil under any management scenario because the program asks simple, universally applicable questions. Make soil health a priority on your farm. We bet you’ll be pleasantly surprised with the results! Our seminar will be held from 8:30 a.m. – 5:00 p.m. Tuesday, January 26 at the Timber Creek Convention Center, 3300 Drew Avenue, Sandwich, Illinois 60548. A block of rooms have been reserved at the Timber Creek Inn & Suites (attached to the convention center) 630-273-6000. Please note, there is no charge to attend this seminar. Reservations were due by January 18, but we have a limited number of seats still available. 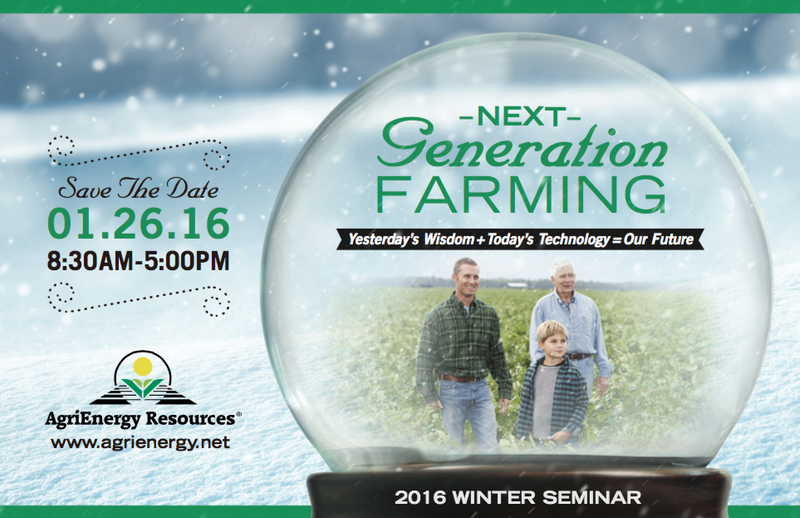 Please RSVP to AgriEnergy Resources 815-872-1190 or info@agrienergy.net. We are so excited to announce our 28th annual winter seminar has been scheduled for Tuesday, January 26, 2016 8:30am-5:00pm in Sandwich, Illinois. With yesterday’s wisdom and today’s technology, your farming future is a bright one. This is one event you won’t want to miss! Learn from an outstanding speaker line-up why we believe biological farming is the future of economical, high-quality food production. Hear experts on soil health, new marketing opportunities, new soil tests, reducing risks, and more. Our detailed agenda will be announced in December. A block of rooms has been reserved at the Timber Creek Inn & Suites (attached to the Convention Center) at our group rate (includes hot breakfast buffet) of $119 + tax until January 8 or $169 + tax after January 8. Call 630-273-6006 to make your reservation. There are no other lodging options in Sandwich, however, some hotels are available along Interstates 88, 55, 80, and 90. Timber Creek Inn & Suites is located at 3300 Drew Avenue, Sandwich, Illinois 60548. We sincerely hope you will be able to join us in January! Today, October 21, 2015, is the day the movie Back to the Future II was set to take place when it was shot and released in 1989. 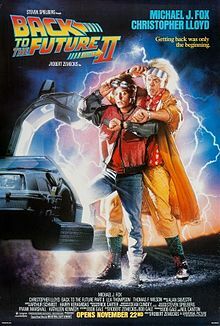 For those of you that aren’t aware, this movie is about the adventures of a time traveler as he travels 26 years into the future to protect his future children from trouble. Needless to say some of the things predicted in the movie, like the Chicago Cubs winning the World Series, were completely preposterous (at the time). Well today, October 21, 2015, the Chicago Cubs are vying for their chance at winning it all. First time playing in the post-season since 2008. Twenty-Six years ago, we were just beginning to find our stride in biological farming. With many, many years of research and experience, 26 years ago is when it all came together. 26 years. We had combines, but we had to physically drive them at all times. Auto-steer wasn’t invented. We had no fancy cell phones to connect with everyone on our team. We had to physically talk with them. Now, 26 years later, we don’t even have to be in our combines to drive them. We can connect with multiple people by the click of a button. We’ve even experienced the hover board and automatic shoe-lace concepts that were referred to in the movie as well. What would you like to see in the year 2041? Leave your ideas in the comments below! Today’s organic farmers operate some of the most high tech machines seen in the industry. Technology that includes GPS RTK guided planters and cultivators, rotary hoes, sophisticated spray rigs, and tine weeders. Seriously, check out this video of the tine weeder that the Hatzenbichler company put together. See this product and other state-of-the art equipment up close during the Doudlah Farms/Dramm Corporation/AgriEnergy Resources Organic Field Day 10am-3pm Tuesday, August 11 at Cooksville Community Center, 11204 N. Church Street, Evansville, Wisconsin. Mark Doudlah, of Doudlah Farms, will be demonstrating his very own Hatzenbichler tine weeder in dry beans (weather permitting) and Matt Sattelberg, of Bay Shore Sales, will discuss weed control and dry bean harvesting. Bay Shore Sales, located in Michigan, carries a full line of Hatzenbichler products. Sattelberg will also be at the Matt and James Beran/Souhrada Custom Spraying & Ag Products/Dramm Corporation/AgriEnergy Resources Organic Field Day Tuesday, August 4 10am-3pm at Beran Bros. Farm, 10083 110th Street, Lime Springs, Iowa. 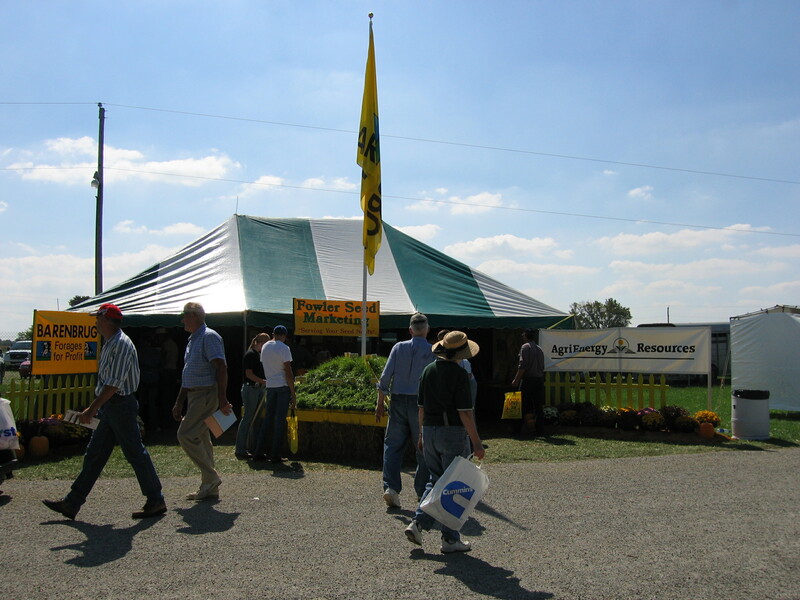 Please RSVP for both field days by calling AgriEnergy Resources 815-872-1190. For more information about our upcoming field days, click here. Our full itinerary has been posted for our upcoming field days we’re co-hosting in August. 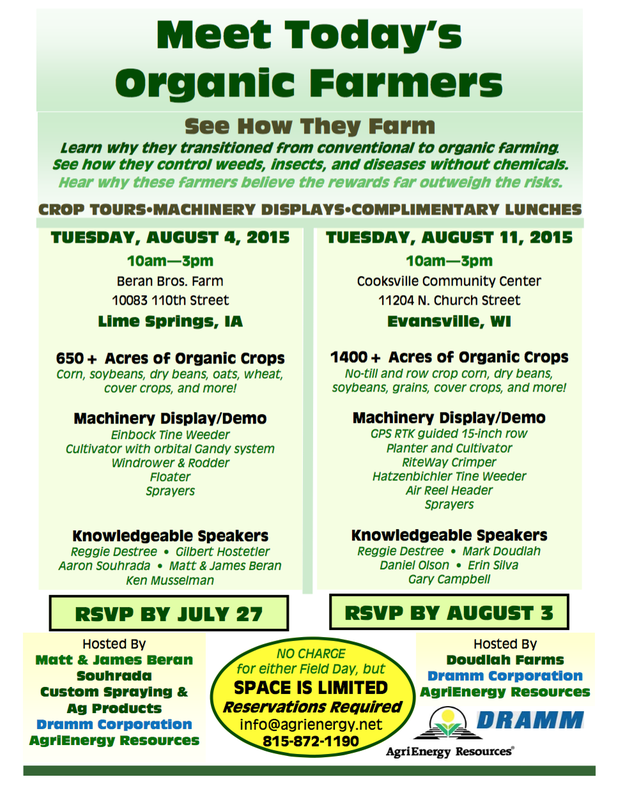 Keep in mind that the last day to RSVP for the Matt & James Beran/Souhrada Custom Spraying & Ag Products/Dramm Corporation/AgriEnergy Resources Organic Field Day is Monday, July 27 and the last day to RSVP for the Doudlah Farms/Dramm Corporation/AgriEnergy Resources Field Day is Monday, August 3. Take a look over the complete itinerary and let us know if you have any questions. Reserve your spot today by calling AgriEnergy Resources at 815-872-1190 or emailing info@agrienergy.net.